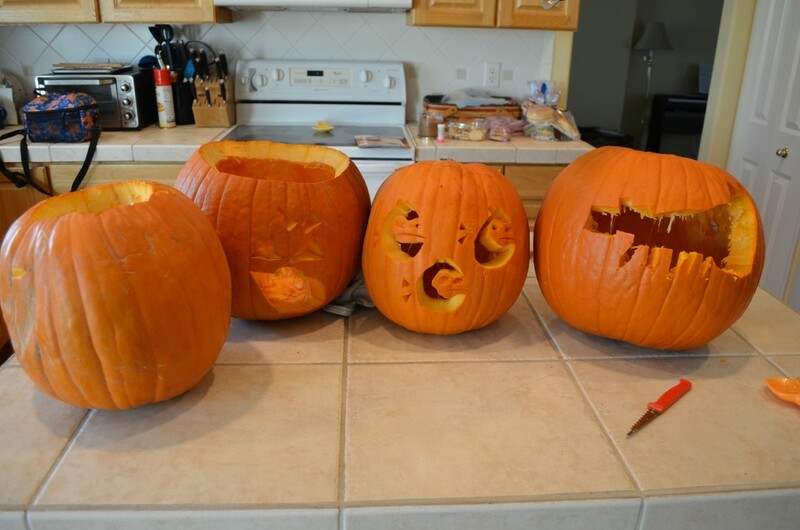 Timmy and I enjoyed carving our four pumpkins this afternoon. 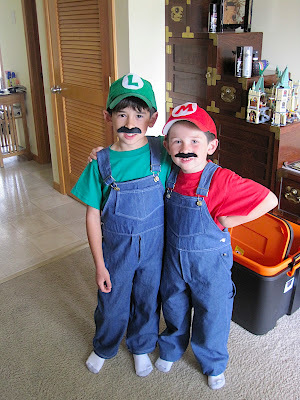 I’m so proud of Timmy, this year he offered to do everything but got really nervous about gutting the pumpkins. So I did it for him…because I’m a sucker for that stuff. And here she is! About 3″ long so far. There’s another one on an adjacent vine that’s a little smaller, I’ll call that one #2! I was surprised this weekend at all the buds that were appearing on my pumpkin plants and decided to give it a go again this year. I had my first two female flowers open up this morning, and there are at least 4 more that will be opening up this week! Two male flowers. These guys are about 8″ across, attracting all sorts of bugs! One of the female flowers. Note the “stigma” in the center, looks different than the male flower above. A view of the bulb behind the flower. 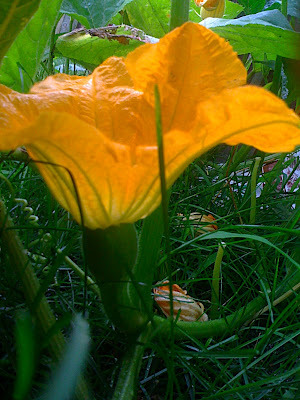 If pollination is successful, that bulb grows into a pumpkin. To hand-pollinate, you select a male flower, remove the petals, and get the powdery stuff on the stamen in contact with the stigma on the female flower. I didn’t photograph the actual pollination, but you can see a 2009 version here. This bee might have been a step ahead of me, there was plenty of wildlife around to take care of things if I had missed those flowers opening. No other female flowers pending at the moment. This is about 1.5 lbs. and about 10″ circumference. I’m so excited at this! Someone on Facebook commented about the breed of pumpkin he was growing, and it wasn’t till then I realized I don’t know what breed this pumpkin is going to be. 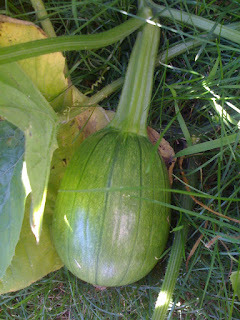 It could be a pie pumpkin, a jack ‘o lantern pumpkin, or maybe one of those state fair pumpkins? We’ll all just have to wait and see…. 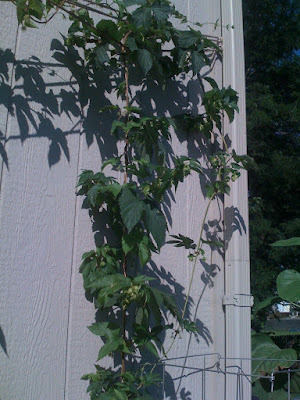 I’m not sure whether I’d mentioned it on my blog, but we are also growing hops in our backyard. 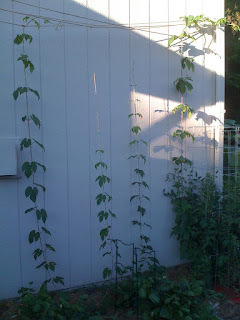 We ordered some rhizomes this past spring from American Brewmaster, the store that Dave frequented for his beer-making supplies while we were living in NC. 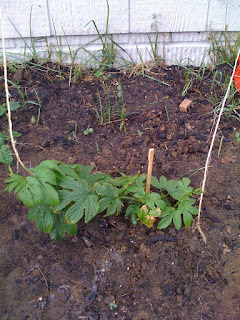 After consulting billions of websites (here’s one) looking for how hops are grown, we learned that Nebraska is at the ideal latitude for growing them, and if the soil is good, and they’re planted in the right place, we could get enough hops to nicely augment Dave’s homebrewing. We weren’t expecting flowers this year. 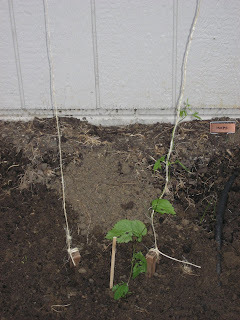 Hops are perennial vines that usually use its first-year growth to focus on strengthening its root system and establishing itself. But whatever we get will be great, and can be preserved for future brews. We’re just starting to see the flowers, flowering is allegedly going to continue through late August/early September, so I foresee plenty for at least one batch for Dave and his friends to enjoy this fall/winter. 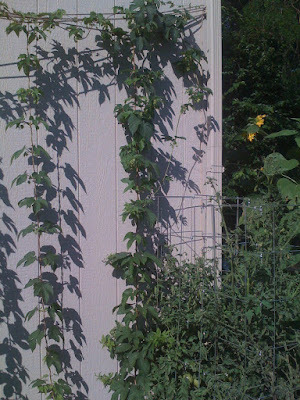 After all, the world is just coming off of a hops shortage, and the homebrewers takes the brunt of such shortages…. If the pollination hadn’t “taken”, the bulb behind the flower would have yellowed and fallen off the vine by now. This was about 52 hours after the pollination, and the bulb has at least doubled in size. I’ll keep you updated on the progress on our pumpkin! 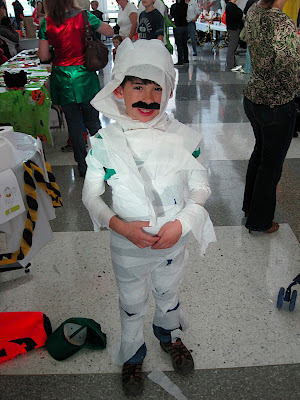 Matchmaker, Matchmaker, Make Me a Match…. And that’s just the part of the one plant that’s come through the fence and is actually bleeding into the front yard! 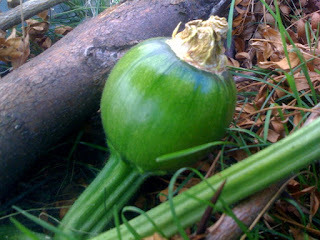 Anyway, I’ve grown pumpkins in the past and the best I traditionally do is 1…at most 2…pumpkins! This time around, I’m going to try my hand at (drumroll please!) hand-pollination! 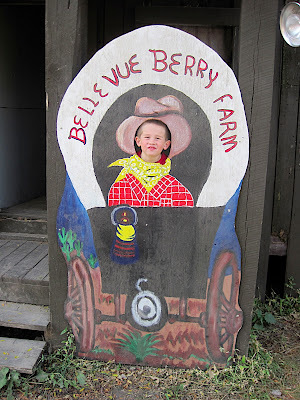 I’d read that those enormous pumpkins you see winning blue ribbons at county fairs are typically hand-pollinated. And those who are super-serious will even use plastic bags to ensure the male and female flowers keep as much of their pollen on hand as possible! How does this work? 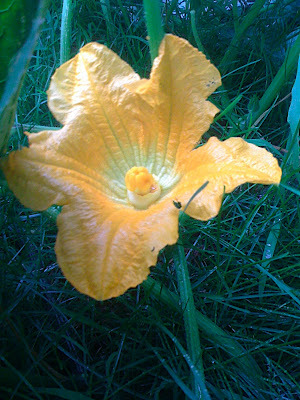 Well, for those who didn’t realize, plants in the squash family — to include cucumbers and pumpkins — have both “male” and “female” flowers on the same plant. 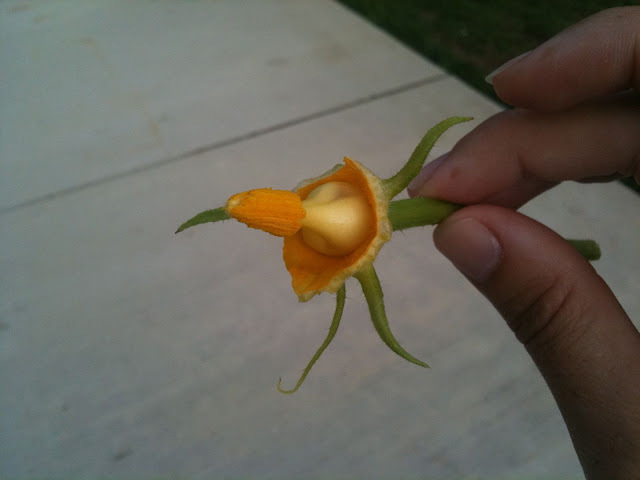 Male flowers are typically bigger and are on a longer stem, while female flowers will have a bulbous piece just behind the flower…which is what eventually becomes the squash itself when pollinated. 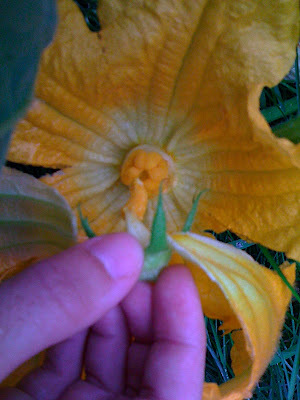 On a pumpkin, the first you’d see male flowers — LOTS of male flowers — and then after several weeks (at least 4 weeks in my case), you will see female flowers appear. I’ve had less than 6 so far. And the female flower. The bulb behind the flower and the multiple “stigma”…with an opening in the center for? You guessed it — the male flower’s pollen! Then you rub the male and female innards together…this is rated NC-17, sorry! Now…some folks who have tried that have reported that you’ll see evidence of success in as few as 12 hours — the bulb will begin growing. 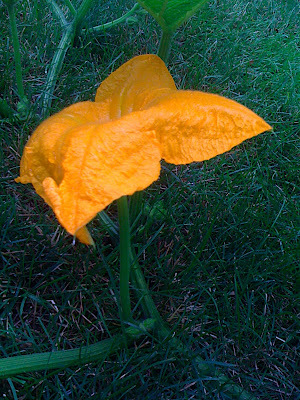 In an unsuccessful pollination, the flower would fall off and the bulb will turn yellow and shrivel off the flower. I’ll check tomorrow morning for evidence of success/failure of today’s pollination. There should be another flower ready to attempt tomorrow.